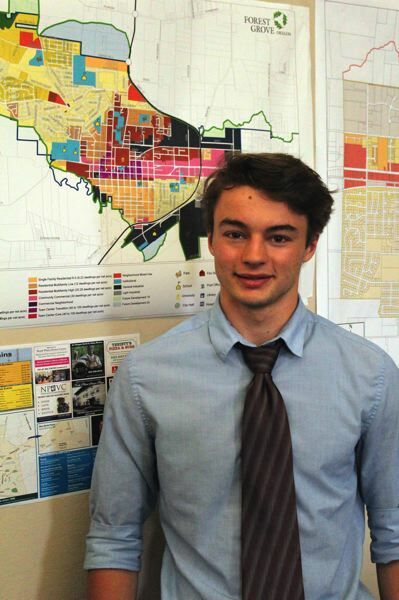 A rising senior at Forest Grove High School, Clapshaw is also an active city volunteer. The age-old debate in politics is "youth versus experience." Solomon Clapshaw, who turns 18 about a month before ballots will go out in the Nov. 6 election for Forest Grove City Council, certainly has youth. But he wants people to know he has experience as well. Clapshaw filed paperwork as a candidate for City Council this month, and he's currently in the process of collecting signatures to be certified for the ballot. A rising senior at Forest Grove High School, he said he was inspired to run by City Councilor Malynda Wenzl, a teacher at Neil Armstrong Middle School who ran for — and won — a seat on the council while Clapshaw was a NAMS student. Clapshaw serves as a student advisor to the Forest Grove Community Forestry Commission. Asked about his professional and academic background, he noted his seasonal work as a vendor at the Forest Grove Farmers Market. He acknowledged, lastly, that he is a high school student. But asked whether he feels he can bring a particular perspective to the City Council as a student in the local public school system, Clapshaw demurred. "I'm more running (because) I think I have ideas that would help the city a lot," he said. One of those ideas is increasing Forest Grove's supply of housing. He thinks the city can take steps to encourage more housing construction, such as by expediting the permit process in certain cases, as well as spur more inexpensive housing to meet people's needs. "That's a big problem that Forest Grove is facing," Clapshaw said. "Everything here is just too expensive." The need for housing stock is only growing, as Clapshaw noted. "More people are moving into Forest Grove than ever before," he said. Clapshaw also said he thinks the city can take relatively inexpensive steps to put in bicycle lanes on local streets. Encouraging bicycling and bike tourism is a stated goal of the City Council. "Forest Grove's already really great for bicycles, but I think we can do better," Clapshaw said. Beyond that, Clapshaw said he hopes to meet members of the public and get their thoughts on the issues facing Forest Grove. He named the "Fireside Chats" made famous by President Franklin D. Roosevelt as a model he'd like to emulate. Clapshaw is aware that his youth is conspicuous, and he acknowledged he has less experience than other candidates in the race. Still, he said, "I do have some experience. I have been an advisor on the Community Forestry Commission for two years. … I do have a bit of experience. I'm not totally just some kid who's just running, and I do at least somewhat know what I'm doing." Clapshaw is one of three non-incumbents to file thus far for seats on the Forest Grove City Council, along with Devon Downeysmith and Karen Reynolds — both of whom serve, coincidentally, on the Forest Grove Committee for Community Involvement alongside Clapshaw's mother, MJ Guidetti-Clapshaw. All three incumbents whose terms are up this year are running again. Wenzl is seeking what would be her second term on the City Council after she was first elected in 2014. Also running for re-election are Councilors Tom Johnston and Ron Thompson, both looking for their fourth terms on the council. "Two of the candidates running have been (on) City Council since I was two years old," Clapshaw said. "So for 16 years, and if either of them win this year, that'll be 20 years of City Council, which is two years older than I am now." Wenzl said when her former student told her he was thinking of running, she encouraged him. While she stopped short of endorsing Clapshaw — they haven't talked about his platform or objectives, she noted — she said she knows he's been working for some time to get more students involved in serving on local boards and committees, registering to vote and otherwise getting involved. "I definitely support him being involved," Wenzl said. "I commend him for being involved." Coincidentally, Wenzl herself is the former student of a fellow member of the City Council: Mayor Pete Truax, who is also up for re-election this year. Truax taught at Forest Grove High School and had Wenzl in his class. For Clapshaw's part, he said that in general, he wants to see more people coming to City Council meetings and otherwise participating in local government. "I've been to a few City Council meetings. I know they're dry. But I think it would be really appreciated if more members of the community showed up and voiced their opinions, because that's the best way to get things done," Clapshaw said. "I hear people complaining all the time about (how) 'the city doesn't do anything.' Well, the city doesn't know what to do unless you come and talk to them." The top three vote-getters in the Forest Grove City Council election will win seats on the council. The mayor is elected separately.